Scientists at one of the world's most advanced observatories are facing an uncertain future, with a closure threat hanging over its flagship project. Jodrell Bank in Cheshire, home of the landmark Lovell Telescope, is part of a network of seven giant astronomy dishes in the eMerlin project. The Science and Technology Facilities Council is struggling to finance it. A Jodrell Bank spokesman said it opposed any cut backs and would push for eMerlin to keep its funding. The project is at risk because the STFC has an £80m shortfall in its budget; and an assessment panel has listed the project as a "lower priority" for UK physics and astronomy. The issue is still in the consultation stages, but closure of the project could leave the University of Manchester-owned Jodrell Bank little more than a study centre. Its scientists have been working on the eMerlin project since 2002, at a cost of more than £2m a year. It is the national facility for radio astronomy and aims to improve links between the dishes to make the radio telescopes 30 times more powerful. The loss of funding in 2009 - the year eMerlin was due to launch - would mean the work could go to waste. Jodrell Bank will put forward representation for the consultation on the STFC plans. 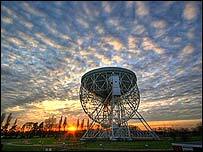 Phil Diamond, director of the Jodrell Bank Centre for Astrophysics, said: "No decisions have been made. It's not just us that's under threat, but we are the most visible. "We were put on the low priority list, and I find that incredible. We are coming to the end of the upgrade, which when it comes on stream we will be one of the most powerful telescopes on the planet, so it is unbelievable. "The potential impact on astronomy would be huge. "We are trying to understand how galaxies are formed, how stars are born - these are all fundamental to how life evolved and we have to understand the whole sequence of creation. "If we withdraw from Merlin and threaten Jodrell Bank, it means that the UK will effectively withdraw from radio astronomy." A spokesman for the STFC stressed that no decisions had yet been taken but admitted some projects would be affected to fit in with budget constraints. He said: "Because of the shortfall in our budget we have to come up with a programme that sits within that financial envelope and we have drawn up a list of priorities to achieve that. "That list will be put to the scientific community for three to four weeks to consult and get their views on it. Nothing is concrete, the process is ongoing and we will be open to responses. "Saying that funding will be cut from any particular project is premature and speculative." Working in Jodrell's favour is the leading role it is playing in the Square Kilometre Array (SKA) project, a giant next-generation radio telescope. The SKA's huge fields of antennas will be sited in Australia or South Africa and sweep the sky for answers to the major outstanding questions in astronomy. But although the infrastructure will be in another country, the headquarters of the SKA will be at Jodrell. The SKA is listed as a high priority in STFC plans.